Michael Dubb, Monomoy Stables, The Elkstone Group and Bethlehem Stables’ ultra-classy Monomoy Girl, winner of the May 4 Longines Kentucky Oaks (Grade I) and top contender for the Breeders’ Cup Distaff (GI), worked a sharp five furlongs in 1:00.20 Sunday morning at Churchill Downs for trainer Brad Cox. With regular jockey Florent Geroux aboard, Monomoy Girl worked alongside stablemate and Monmouth Oaks (GIII) runner-up Sassy Sienna through splits of :13, :26, :37 and :49.20, according to Cox’s watch. Monomoy Girl is scheduled to ship to Parx Racing in Bensalem, Pa. on Wednesday to run in the $1 million Cotillion (GI) on Saturday. 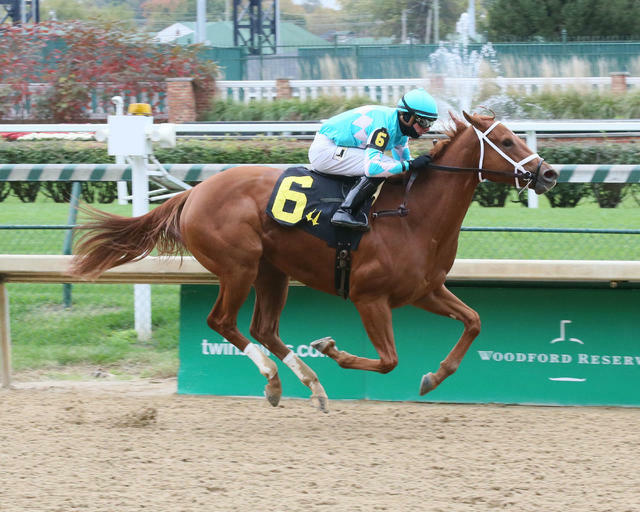 A 3-year-old daughter of Tapizar, Monomoy Girl has only one blemish in her stellar nine-race career – a runner-up effort as a 2-year-old in the Golden Rod (GII) at Churchill Downs. Following her narrow Kentucky Oaks win over Wonder Gadot, Monomoy Girl successfully tackled the June 9 Acorn Stakes (GI) at Belmont Park before her three-length win Coaching Club American Oaks at Saratoga. Monomoy Girl is likely to face fellow Kentucky Oaks contenders Wonder Gadot and Chocolate Martini in the Cotillion. The Breeders’ Cup will be held at Churchill Downs for a ninth time on Friday Nov. 2 and Saturday, Nov. 3. For more information, visit www.BreedersCup.com. CAIRO CAT STAMPS TICKETS TO BREEDERS’ CUP JUVENILE FOLLOWING SATURDAY’S IROQUOIS VICTORY – Walking L Thoroughbreds’ Cairo Cat stamped himself as one of the top contenders for the $2 million Sentient Jet Breeders’ Cup Juvenile (Grade I) after besting 11 rivals by a half-length in Saturday’s Iroquois Stakes (GIII) at Churchill Downs. AMOSS ‘ABSOLUTELY THRILLED’ WITH 19 ½-LENGTH POCAHONTAS WINNER SERENGETI EMPRESS, READIES FOR BREEDERS’ CUP JUVENILE FILLIES – Joel Politti’s Serengeti Empress marked herself as a likely Breeders’ Cup Juvenile Fillies (GI) favorite following her jaw-dropping 19 ½-length score in Saturday’s $200,000 Pocahontas (GII) – a “Win and You’re In” for the $2 million championship race on Nov. 2 at Churchill Downs. STAKES PROBABLES – Saturday’s 11-race program at Churchill Downs features the 43rd running of the $100,000 Dogwood Stakes. The following horses are probable to enter the field, according to Churchill Downs’ stakes coordinator and assistant racing secretary Dan Bork: Everyonelovesjimmy (trainer Ian Wilkes), Go Google Yourself (Paul McGee), Primo Extremo (Jason DaCosta) and Salt Bae (Bernie Flint). Entries for Saturday’s card will be taken Wednesday. To view the full list of nominations for the Dogwood, visit: https://bit.ly/2NfTx5v. DOWN THE STRETCH – On Sunday there is a two-day carryover of $10,842 in the 20-cent Single Six Jackpot (Race 5, 2:45 p.m.) and a $3,953 carryover in the $1 Super Hi 5 (Race 10, 5:26 p.m.). … The September Meet will continue on a Thursday-Sunday schedule for the remaining two weeks of racing. Thursday will be the first Twilight Thursday of the meet with a first post of 5 p.m. Fans will enjoy $1 beer, local food truck faire from Flavaville, Mark’s Feed Store, Red Top Gourmet Hot Dogs and Zoom Zoom Yum, live music courtesy of the Sheryl Rouse Band and lawn games.